In one of my previous posts I had talked about creating or rather restoring a deleted database backup. There is another option in preview called the automated export which allows you to create an automated export copy of your Azure SQL Database. The Azure SQL Database Import/Export Service is a REST-based web service that runs in every Microsoft Azure data center. The service provides a free request queuing service and a free Compute service to perform imports and exports from a Microsoft Azure SQL database to Microsoft Azure binary large object (BLOB) storage. The import and export operations are not a traditional physical database backup but a logical backup of the database that uses a special BACPAC format. This logical BACPAC format lets you avoid having to use a physical format that might vary between versions of SQL Server and SQL Database. Therefore, you can use it to safely restore the database to an SQL database and also to a SQL Server database. 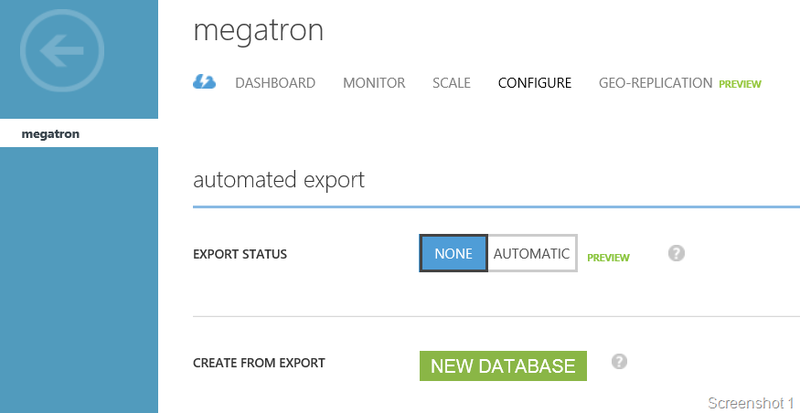 As you can see from the screenshot, the Configure tab in the Azure Management portal for my Azure SQL Database, megatron, has an Export Status set to None. As usual, this is a PREVIEW feature and the above is true as of today when I am writing this post. This functionality could change in the future. Read on to find out what happens when I change the setting to Automatic… Is is as easy as 1-2-3?